Welcome to Blog Hop Number 2! This is the second of three blog hops for the B’Sue Boutiques Build A Line challenge, hosted and taught (for free!) by the fabulous, knowledgeable and very generous Brenda Sue of B’Sue Boutiques. In Blog Hop Number 1, I introduced myself and my Etsy shop, Ameme Designs, and I showed the evolution of my design skills since I began making jewelry. I also gave a quick view of my ideas for my line, and the components I was considering. Fast-forward to Blog Hop Number 2, and my line is shaping up in my mind if not actually on the work table. I’ve dropped the ribbon, added in rhinestone chain around the cabochons and I’ve started giving serious thought to chain – a necklace has to hang from something, after all. 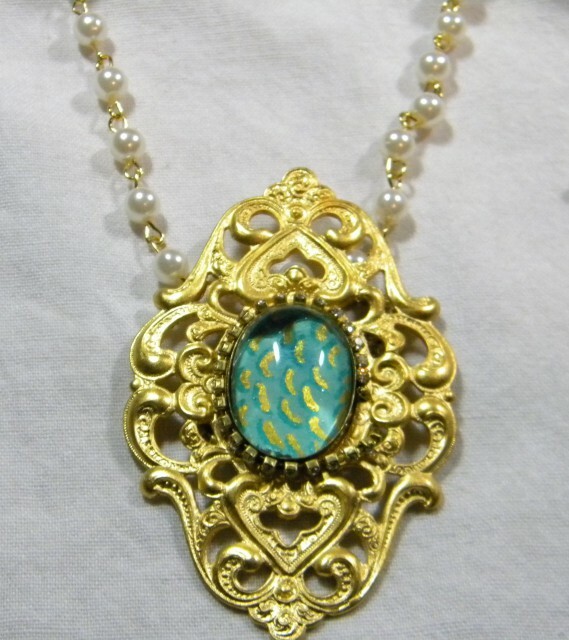 The move away from using ribbon in my line changed the aesthetic slightly, and as I experimented with adding the rhinestone chain, the name of my line came to me – “Simply Luxe” – the designs are simple, but they look quite rich due to the custom-finish brass cameo stampings with turquoise and gold cabochons, the rhinestone adds the bling they need. In addition, I’ve been joining into conversations with my classmates, and reading and watching videos that cover all aspects of fashion and jewelry design and marketing. I’ve learned so much. One of the things I’ve learned? That I need to learn so much more! But now, thanks to this class and challenge, I know what I need to learn more about. While I had hoped to have one piece to show you today, real life had other plans for me this week. So you’ll need to pop back next month for the final reveal – Blog Hop Number 3! I hope you enjoyed my second blog hop article, I hope you have a little time to “hop” around this list of blogs below, and give them a like or a comment. 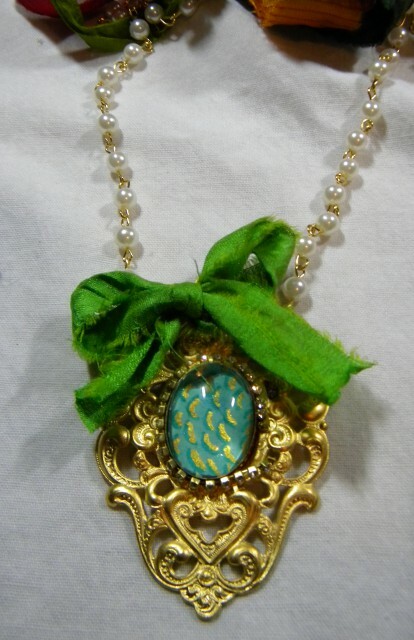 My daughter gave me a beautiful pendant that the jewelry designer hung from ribbon. The first thing I did was find a necklace to hang it on. I chose a short beaded necklace (almost a choker). So, I think that moving away from ribbon to the rhinestones and chain necklaces is a good idea. I like what I see in the photos. Looking forward to the next post. 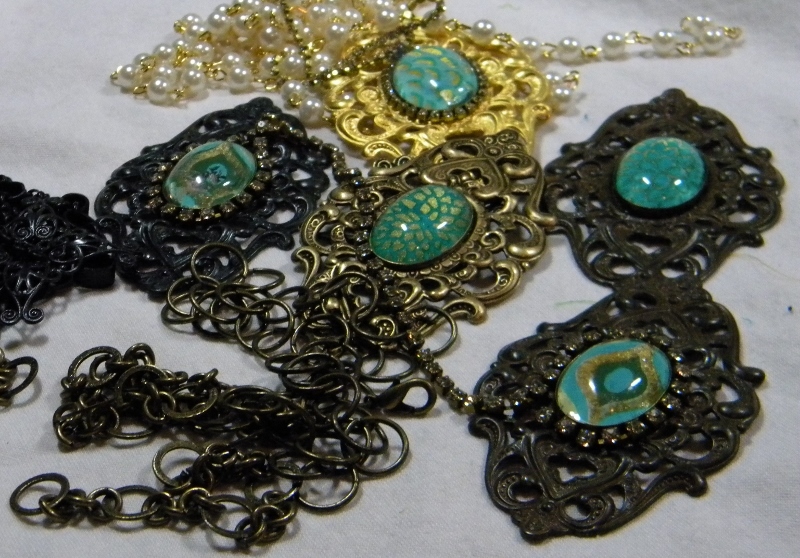 Love the cabs and filigree you chose. Looking forward to the final reveal. Loving your paper under lens cabs- looking forward to seeing your line revealed in a month ! Love those multi-tonal pieces. Looking forward to seeing more pieces. Nice pendents, they look very vintage. I can’t wait to see your reveal in March. The piece you chose to feature has always been one of my faves and goes back to the Victorian Revival period of the fifties, possibly reworked from a much earlier die. Keep going, you are on the right track! I think your theme is wonderful and i love the componenets you have shosen!!! Great Job, can’t wait to see more!!! Be Blessed! Can’t wait to see your finished line! Great work thus far! Amy–It definitely looks like your line is progressing in a good direction. I like the addition of the rhinestone chain. Looking forward to seeing your final reveal! Beautiful peacock coloring! With your sense of style you’ll soon get them all finished up! Love the line. The focals are neat and the chain around the cabochon looks great. Can’t wait to see your line. You’re really on the right track with your designs, Amy. Love the cabs you’ve made and how cohesive your line looks already. Gotta love that rhinestone chain! These are looking so elegant. What a great line and I can’t wait to see the final reveal! Seeing how you’ve tweaked your concept is fun. I think sometimes the chain is somewhat of an afterthought in lots of jewelry so by taking a thoughtful approach to how to manage the chain will enhance your overall look. Looking forward to the final reveal. Love your line and your handmade cabs can’t wait to see the rest! XOXO! 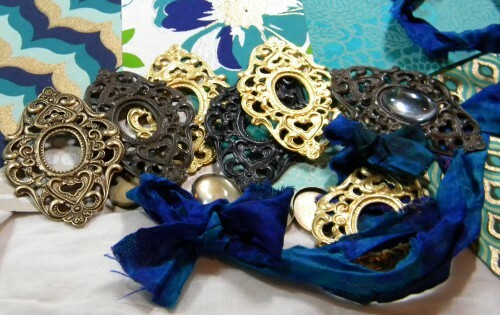 Hi Amy, I think that lots of people like to look at the ribbon, but not necessarily buy or wear it because they are afraid it will be hard to clean. You can’t go wrong with chain! ~Renee H.
Loving the colors of your focals. I think the decision to remove the ribbon will ultimately make your designs more durable. I love the look of fiber jewelry, but it doesn’t hold up to regular or longer term wear the way metals and other components will. Love the cabs. Can’t wait to see more. I still really like the direction you’re going with these and I’m looking forward to seeing the rest too! Great post and great idea to use the rhinestone for bling! Looking great! I love the colors in your cabochons. I just love your choice of colors, Amy. This is coming together beautifully. Looking forward to seeing your line. I’m liking the rhinestone chain, though I’ve never used it before, I find myself being drawn to it. Your post has helped me decide to add that to my list of “things I need” It makes a definite positive change to your designs. It’s amazing what one little change will do. Swapping out the ribbon for rhinestones was a great choice. Well done! I agree. They are very beautiful the way they are! Probably my biggest problem is the neckline treatment. It takes me too long to decide on the best chain, etc to use I think. Really looking forward to seeing how you’ll be finishing these beauties.